“She’s alive!” In 1931 Frankenstein, based on the novel by Mary Shelley, was such a phenomenon that while a sequel was a no-brainer to some, including the studio that produced it, it was an obvious mistake to others, including the man who directed it. James Whale had to be badgered and cajoled, and the more he resisted, the more certain everybody grew that he was the only one who could do it. Seizing on one of Shelley’s afterthoughts in her story about the mad scientist who flirts with immortality, Whale did what artists sometimes do when they have nothing to lose: raised his own stakes and turned the sequel into something at once more lyrical and deeply strange. 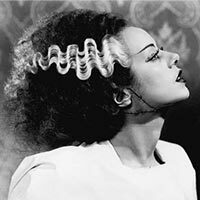 An unsettling eroticism between Boris Karloff’s Monster and the Bride played by Elsa Lanchester—styled as an electrified Nefertiti, her unearthly hiss emulating swans that the actress heard in London parks—alarmed censors around the world, where the movie was banned from Asia to Europe to Scandinavia. The Bride’s revelation is that what haunts the heart is more terrifying than what shocks the senses.